“With the earthquakes, tornadoes, melting icebergs and all the other problems threatening the world right now, Earth really needs her greatest defender,” says Susan Montford, producing partner to Don Murphy (the man behind Transformers). 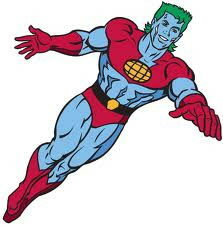 So with that in mind, the pair have announced plans to bring Captain Planet, the environmentally friendly superhero created by Ted Turner in the early 90s, to the big screen. No major studio is attached, nor are their any writers or directors mentioned in the report, but expect a redesign of the Captain when casting announcements come out. A buff, baby blue skinned man with red briefs and green hair would hardly fare well in a marketplace that things The Green Lantern looked silly. Comments for A “Captain Planet” Movie Is Happening are now closed.